Telephone: 0086-755-88895000. Please note, the operator speaks Chinese only. 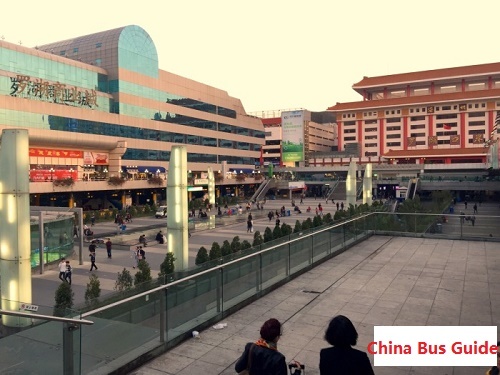 The national class Shenzhen Luohu Bus Station locates on the 1st to 2nd floors of the prosperous Luohu Commercial City in the downtown, bordering with Shenzhen Railway Station and Shenzhen Luohu Port. Luohu Bus Station is one of the oldest while busiest bus stations in Shenzhen as many people crossing border from Hong Kong would choose to depart here for Macau, Zhuhai, Dongguan, Jiangmen, Chaozhou, Jieyang, Shantou and etc. Luohu Bus Station covers an area of 12,000 square meters. It operates 39 bus routes with 1,160 daily bus departures transporting nearly 20,000 people per day. Luohu Bus Station has two floors. The 2nd floor consists of ticket hall, left luggage office, information desk, ticket vending machine and so on. Both waiting room and bus departure area are all located on the ground floor. That means, passengers who have successfully obtained their tickets should walk downstairs and go to corresponding waiting area to check tickets and board the buses. Note please, Shenzhen Luohu Bus Station has three entrances and passengers should go through corresponding entrance to enter the station and check tickets to board their buses. Entrance B is for bus routes for Haifeng, Boluo, Zhongtang, Dongpu, Foshan, Dongyuan, Heyuan, Zijin, Shantou, Lianzhou, Xiashan, Chaozhou, Zhongshan, Shanwei, Jiedong, Leizhou, Raoping, Xinyi, Huazhou, Zhaoqing, Nansha, Shaoguan, Jiedong, Qiaotou, Shilong, Heshan, Macau, Jiangmen, Zengcheng, Taishan, Yunfu, Enping, Kaiyuan and Qingyuan. 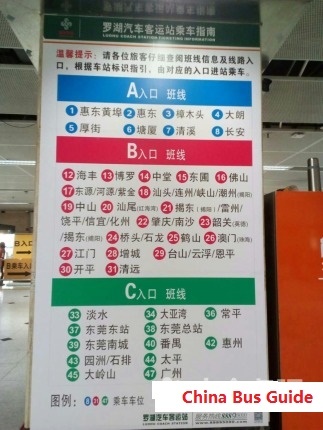 Entrance C is for bus routes for Danshui, Daya Bay, Changping, Dongguan East Bus Station, Dongguan General Bus Station, Dongguan Nancheng, Panyu, Huizhou, Yuanzhou, Shipai, Taiping, Dalingshan and Guangzhou.  Bus routes 101, 102, 12, 17, 1, 205, 215, 25, 302, 306, 38, 7, 82, 83, 97, K538, K545, K401, N4, Airport Bus line 2, 306, N14, N15, N16, N18, N2, and N7 stop at Shenzhen Railway Station (深圳火车站).  Shenzhen Metro Line 1 stops at Luohu Metro Station. Luohu Bus Station locates at the A exit of Luohu Metro Station.